Melbourne milliner Louise Macdonald has a reputation for quality and sophistication in headwear. Her fashion range has unique and beautiful pieces to wear when attending a wedding, a party or events of the Spring Carnival Racing (such as Melbourne Cup, Derby Day and and Oaks Day), Dubai World Cup, Royal Ascot or Kentucky Derby. Subscribe to her newsletter and receive information about fashion collections by email. What influences your designs? Where do you get your inspiration? When do you start preparing/planning for the Melbourne Spring Racing Carnival? 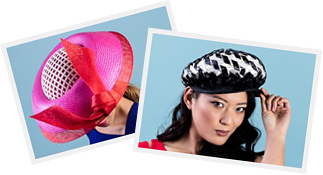 Delivery – You can collect your fashion hat or fascinator at Louise Macdonald's studio in Melbourne or it can be sent to you (Australia or overseas). The postage cost will be informed on request.